Developed by Cathy Thompson through her many years as a bodywork therapist, the Thompson Method incorporates Zen shiatsu, Rolfing, yoga, and Gestalt psychotherapy to heal pain in the physical body both through bodywork and by recognizing the emotional blockages that often underlie chronic pain, tension, and poor alignment. 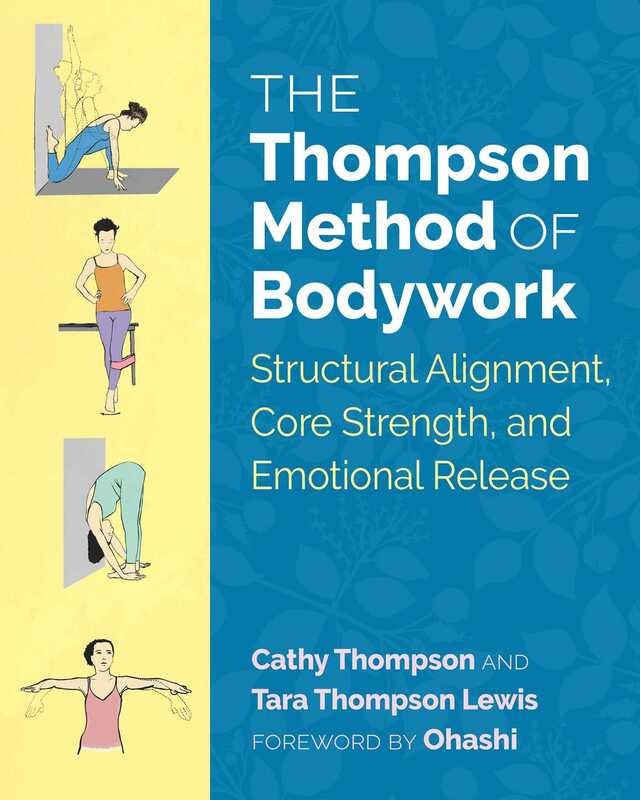 In this practical manual, Thompson and her protégé-daughter Tara Thompson Lewis provide a deep understanding of body mechanics and how to work with emotions through the body. They explore how to listen to the body’s signals to discover our physical and emotional blindspots--the weaknesses and misalignments at the root of our discomfort--and explain how transformation of your physical structure can correct imbalances in the unconscious mind caused by repressed memories and emotional traumas. Offering illustrated instructions for 90 corrective alignment exercises, the authors show how to release body tensions, realign the body’s dynamic structure, work with the deep postural muscles, and support the neck, shoulders, lower back, and feet to strengthen the emotional and physical body as well as improve singing, dancing, yoga, and posture while sitting at the computer. They also explore breathing and bodywork practices to release the vocal mechanism and free the voice for more fluid and powerful self-expression. By recognizing and releasing the deeper emotional triggers beneath our physical complaints, the Thompson Method allows you to resolve chronic pains, increase body awareness and free movement, and create the foundation for good health and well-being. There are lots of excellent and easy-to-follow exercise books and programs you can buy; they seem to multiply daily. The intention of this book is not to add to the collection but to make any other books and programs you choose easier to follow. The exercises you’ll find here are all corrective in nature; in other words their aim is to balance and realign you. That is why I have written so extensively on the specific way you should do each one and suggested lots of props. It’s really important that you do each exercise correctly. That may be tedious but the payoff will be that you’ll feel a lot better and, hopefully, you’ll reduce both pain and your risk of injury. I’d much rather you do one exercise exactly right than lots of them with poor alignment, so please follow along and do them as prescribed! Most of us have numerous imbalances that are reflected in everything we do. The imbalances feel right to us over time because they’re familiar to us. Anything we’re used to starts to feel right, even to the point where the correct movements and more balanced alignment feel 8 wrong. And mostly it’s these chronic imbalances that cause pain and aging. It can also set us up for injury. Perhaps you chronically stand on one leg--no wonder that hip is tight. Or you sit all day at a desk with your head tilted to see the computer screen; that’s why you have a neck pain. More subtly, you see better with one eye than the other, so you keep your head at the optimal angle for seeing but not for structural health. You may be able to change some of your physical imbalances just by realizing how your habits create them. However, the chances are that even though you become aware of some habits, you don’t know how to correct the imbalances they set up. You may have not used certain muscle groups for so long that your brain doesn’t register them and you don’t know how to engage them consciously. This is not a lack of physical strength--it’s a neurological blind spot; we generally develop more and more of these as we get older and accumulate injuries and compensations. Some people, healthy in all other respects, end up with only a few restricted movement patterns. This is where the corrective exercises come in. Corrective exercise is different from other types of exercise in that it targets the specific muscle pathway you need to activate. This isn’t easy at all. A compound exercise, like a pushup, uses a lot of muscles, and if you have some “switched-off,” that is, inactive muscles, your instinctive body wisdom, wishing to avoid injury, won’t let you use them. Unused muscles tend to be hard to feel and use not only because they are weak but because the nerve pathways that conduct the impulses from the muscle to the brain are not developed. It takes careful attention to the placing of your body, your alignment, focus on the area you want to help, and a slow pace to change the reflex to avoid the inactive muscle pathway. Mental focus will send blood and nerve energy to the area, helping to connect the nervous system to the muscle. The exercises in this book will force you to use the weak muscles and not any others, which can be very hard to differentiate on your own. It may take some practice to do them easily, but with patience you will learn to feel and work the inactive muscles. You will then be able to transfer this feel for the muscle to your everyday life. The design of the shoulder joint makes it vulnerable to injury unless we strengthen the internal muscles, primarily the rotators, but also some parts of the larger muscles. Since the joint is designed to move through such a wide range of motion, it is held together by soft tissues: ligaments, tendons, and muscles. The joints are shallow and not tightly connected. So the design that makes it possible for us to do all those amazing things with our arms also makes the shoulder susceptible to tension and injury. The most important aspect of shoulder health is the relationship between the head of the arm bone and the joints. For a well-functioning shoulder and also to correct a lot of neck problems, you need to be able to keep the head of the humerus within the confines of the shoulder joint, especially when lifting and carrying things. This exercise will help to correct rounded, internally rotated shoulders, tight chest, and “winged” shoulders that do not lie flush on the back. It corrects muscle imbalance in the rhomboids (weak and loose), serratus anterior (tight, weak, or strong) and pectoralis minor (tight, probably weak). 1. Bring your palms over your ears at a right angle to your forearm. Engage the bottom of the shoulder blades to pull both shoulders down, and keep them dropped (you will have to keep thinking about this). Make sure both shoulders are even and your head is in line with the spine. Gaze straight ahead or slightly upward. 2. Now, keep the alignment and draw the elbows back as far as you can. Make sure the upper arm comes back with them. 3. Engage the muscles between the shoulder blades (rhomboids) tightly; squeeze hard. Use these muscles to press the shoulders down farther. 4. Hold this and check your position--head in line, palms pressed into ears, shoulders even and down, chest open, back straight. Try to bring the inner wrists to the ears. To modify: Take the same position, but this time bring the wrists away from the ears as far as you need to keeping the fingertips on the sides of your head. Hold as long as you can. Cathy Thompson (1957-2008) was an innovative bodywork practitioner with a private practice in Manhattan for 30 years. She worked with many famous singers, actors, athletes, and dancers. She studied Ohashiatsu at the Ohashi Institute and Gestalt psychotherapy at the Gestalt Institute of New York. She also taught workshops and trained students in the Thompson Method. Tara Thompson Lewis studied the Thompson Method intensively with her mother Cathy Thompson and was a Brooke Scholar at Oxford University before taking over her mother’s private bodywork practice. She lives in New York City.